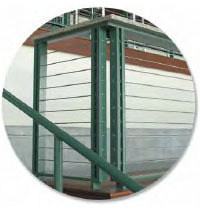 Frame components can be carbon steel or stainless steel. This style has been designed to perform satisfactorily when subjected to the tension encountered when multiple load points (cables) are attached and tensioned properly to your end posts (225 lbs. or more per line). Note the tube corner sections that are illustrated. They replace corner post with hardware mounted on two sides or two posts with cable pulled between them. The cable runs through tubes welded to two posts. It makes a nice looking corner with uniform curves going around the corner. 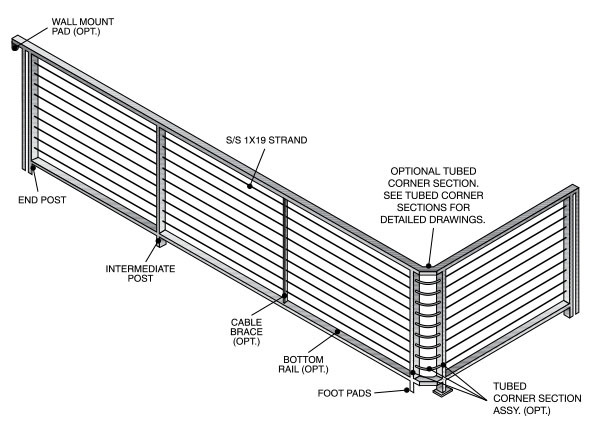 See Tubed Corner Sections for detailed drawings.